Consequently, there is no indication for the prospective buyer that the book is actually a revised version of the original; rather it is made to appear to be simply a re-printing of the original—by the same author! The BBT editors, remaining incognito, continue to plagiarize Srila Prabhupada’s name and fame to lend credibility to their in fact re-written version of the Bhagavad-Gita As It Is, originally designated as the “Complete Edition” by Srila Prabhupada himself. Or the time when devotees told Srila Prabhupada about a newspaper article claiming that a space probe to Mars had sent back photographic images that so closely resembled the terrain in Arizona. Srila Prabhupada said the scientists involved were themselves in Arizona, simply revealing their own minds, reflecting their surroundings. The impertinence knows no bounds, because BBT editing has become a co-authoring of Srila Prabhupada’s books. Buyer beware! Milk still looks like milk even when containing poison. What Ever happened to the BBT printing of Srila Prabhupadas books? I couldn’t belive this second edition was printed in China!!!!! Now we know that this wrong has been done, what is the next step? I would suggest that BBT should immediately stop printing and distributing this revised and enlarged edition. Secondly, all the GBC members and Sanyasis must demand and put pressure on BBT that it be done. These protectors of Iskcon must come out publicly and express their opinions on the matter. That way every one will know where they stand. Thirdly, all the book distributors and temples should stop buying and distibuting/selling this revised edition. I invite your active involement in the matter. Elsewhere on this site you can read my analysis of two verses which are incorrectly translated in this so called corrected revised Gita. I fell ashamed and will do every thing possible to reverse this wrong. I call upon every one to ponder over the points outled here and do something concrete. Mere criticism will not bring any change. It is extremely clear that Srila Prabhupada did not wish for any modifications of his books, as is thoroughly confirmed from his words. These changes are being made by members of the BBT, GBC, etc. I think we’d be hard-pressed to convince them to go back to the original printings considering they’ve been distributing the revised editions since 1983. The original versions of the books will just have to be found and spread by real devotes who are sincere. The fact that they removed the “revised” title after RE-revising the already revised book is beyond misleading. Now it appears that this is Prabhupada’s Second Edition. This is very tricky. It was misleading enough with the “Revised and Enlarged” title. At least let it be advised that these are NOT the original texts written by Prabhupada. It seems to me that they are the false spiritual masters Krishna says in the Gita will banish to the darkest reaches of the universe. These men are supposed to be followers of Guru’s teachings, yet they change them and are misleading the readers by suggesting they are the original texts from Prabhupada! [03:37]Is that escaping? Or it is intelligence? [04:41]That you work hard and give it to me, we enjoy. [04:46]This is intelligence, it is not escaping. [04:52]That is going on. The capatilist, they are engaging these rascals, asses in the factory. [05:01]And he is enjoying life. So that is intelligence. [05:03]That let this rascal work hard and make a nice park for us and we shall take advantage of it. [05:24]Ajara means the big snake, is called ajara. [05:29]So this mouse, they make hole and want to live there. [05:34]And they are comfortably living and in the meantime the ajara comes. [05:38]He eats that mouse and lives comfortably. [05:49]but we take possession of the house and live comfortably. I went on Jayadvaita´s swami personal site and noticed the next things. 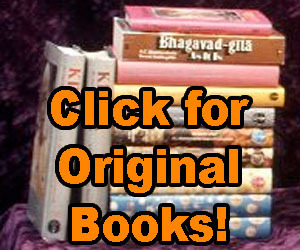 First of all i don´t want to blaspheme any person on this site, but as swami i wonder why advaita doesn´t put srila prabhupada´s book on top of his site ? When i search for The Mahamantra on the site i can´t find it , but read on the top “satyam param dhimahi” This is a mantra against corruption. (but isn´t the Mahamantra the primary Mantra to remove all the dirt from the heart)And under it, posted at 9-11-2011 a story about the (movie crash) wich took place on 9-11-2001. The only solution is to personally acquire Srila Prabhupada’s original Bhagavad gita from KBI and distribute them. Gradually we will excede Upa-Iskcon’s distribution. ISKCON and the BBT took the path that Arjuna argued with Krsna that he wanted to take. They left the field of service and now are rewarded with defamation only. That is a reward that they revel in, which indicates the seriousness of their own mental and material condition. They are not leaders of men they are leaders of sheep. The bona fide Prabhupadanugas are leaders of men and the world is theirs to lead for Srila Prabhupada. Bhagavad Gita is perpetually navayovanam. The solution to this dilemma is really a simple one, but it requires astute, vigilant, spiritual leadership. The GBC will have to step forward and represent the will of Srila Prabhupada to rid the movement of this unending controversy which has disturbed the minds of devotees for the past thirty years. The first thing they must straighten out is that, according to the Directions of Management, all BBT trustees must also be members of the GBC. By enforcing this principle, which was never violated during Srila Prabhupada’s presence, the GBC will automatically begin to restore order to the BBT editorial department. Then, the decision as to which edition of the Bhagavad-gita will survive will be market driven. There will be no banning of either edition. Book distributors will be given the choice of which edition they want to sell. Temples will also decide which edition they will display on their book tables. Devotees giving class will be permitted to preach from the edition of their choice. Let the market decide. If the demand for one edition wanes, the BBT will not be able to print it in smaller and smaller quantities. There is already enough information posted on the Internet for anyone who wants to evaluate the pros and cons of the original Bhagavad-gita As It Is vs. the revised modern edition. Both editions are now available from the BBT so all devotees who prefer one edition over the other can purchase it, study it, distribute it and attract innocent seekers of the truth to the world of devotional service. Nothing more needs to be written. Everyone can just make plans to go out and sell Srila Prabhupada’s books, because introducing the book is what creates the opportunity to preach. Whichever edition proves to be the better preaching tool is the one that will stand the test of time. We don’t care about the market Prabhu. It doesn’t matter what the market wants. We have to do what Prabhupada wants. Haribol, Madhudvisa prabhu — Of course you are correct. We should do what Srila Prabhupada wants, but the GBC members and BBT trustees are all thinking that he wants the revised edition. We have been preaching the opposite for thirty years, that Srila Prabhupada did not want changes made without his approval, but no one, neither you nor I nor anyone else, has been able to convince a single member of the GBC or a single BBT trustee to speak out against the 5,000 revisions made to the Bhagavad-gita As It Is. So how do you stop the printing of the revised edition? The answer is very simple — by flooding the market with the original Bhagavad-gita As It Is. As you know, the KBI (licensed to print the original Gita) is not permitted to sell to the temples, but they are selling to the BBT which is making the original Gita available to everyone. 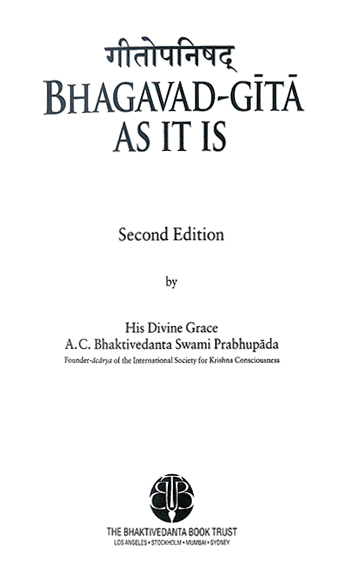 The more the original Gita is sold, the less demand there will be for the revised edition. No scholar will touch it because there is no annotation of even a single revision which would show it is not the author who has made these so-called corrections. To understand how the BBT determines it policies, follow the money trail. Based on demand from book distributors, temples and congregation members, they will print whichever books strengthen the BBT financially. Everyone who wants a revised Gita already has one. Now it is time for the BBT to switch back to the original Bhagavad-gita As It Is because the demand is and always will be unlimited. It’s up to all of us to prove this point by distributing the fully approved and fully potent original Bhagavad-gita As It Is, just as you have been doing. Thank you for setting such a wonderful example. 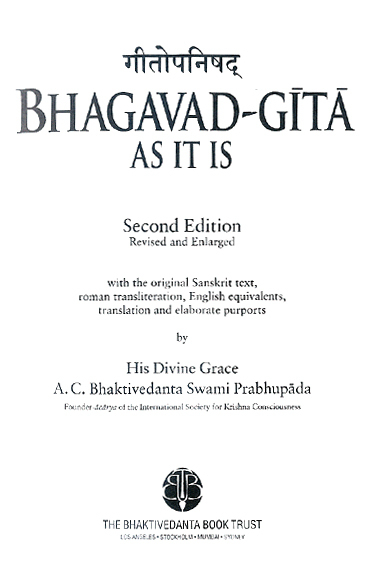 BBT do not purchase Prabhupada’s original Gita from KBI, they print it themselves in India because Madhu Pandit of ISKCON Bangalore purchases it from them. So BBT have their own printing of Prabhupada’s original Gita and they have had this for a very long time, since 2001. Actually it is not about money for the BBT. If it was about money they would never have changed the books. From the financial point of view changing the books has been totally disastrous for the BBT. Now most of their potential customers do not trust them and do not want to purchase Prabhupada’s books from the BBT because they have made so many unauthorized changes to them. And this is going to increase unlimited in the future until the BBT have no customers at all. In a sense that is what they want. They are envious of Srila Prabhupada and want to destroy the distribution of his books. And Prabhu so far they have been very successful at this. Just imagine if the BBT had not made all these unauthorized changes to Prabhupada’s books and the distribution of Prabhupada’s books had continued increasing from the levels it was at in 1977. The world would be Krishna conscious now and the BBT would be the biggest publishing house in the world. I know for a fact that the BBT does not care about making money. Many years ago I had a very memorable conversation with Jayadvita Swami in that restaurant that Kirtananada used to have in his ‘sanctuary’ building. At that time the BBT were about to reprint the Cc. and I was lobbying them to print the original Cc. and the previous year they had agreed to print the original Cc. but JAS and Dravida had spent the previous twelve months convincing the BBT to change their mind and print Dravida’s changed edition instead. And of course the BBT changed their mind and printed the changed edition… So at this meeting with Jayadvaita I put it to him quite bluntly that if he prints the original Cc. it will sell like hotcakes and BBT will make so much money from it because the original Cc. has been out of print for so long, and no one wants to purchase a changed Cc. so the BBT will loose absolutely no sales because of printing the original edition. But I presented to Jayadviata, on the other hand, if you print the changed Cc. there will be practically no sales because a very large percentage of the BBT’s potential customers will not purchase the changed Cc because they don’t like the changes. And anyhow this was going to be a small edition so at that time the changed Cc was already in print in the large edition and the single volume edition so anyone who wanted it has already got it. So JAS was faced with the decision to reprint Prabhupada’s original Cc. and have it sell like hotcakes. They could have sold a thousands of sets in a month or two, easily. And it would keep selling so well and make so much profit for the BBT. Or he could reprint the changed Cc. and sell practically none of them. So JAS agreed with my analysis and said I was correct, but he put that horrible smirk he has on his face and said, “But I want to print the revised edition.” So Prabhu you see it has nothing to do with making money for the BBT. Jayadvaita consciously and openly choose to print the changed Cc. knowing that it would not make any money for the BBT, and knowing that if he printed the original Cc. it would sell like hotcakes and make a huge amount of money for the BBT. Prabhu if the BBT wanted to make money they would never print books with unauthorized changes in them. They know very well that there is no better way to destroy the authority and sales of religious books than by making unauthorized changes to the books. They are making these changes with the intention of destroying the sales of the books. I want to add to your words, that only the second edition BG translated into other languages​​.